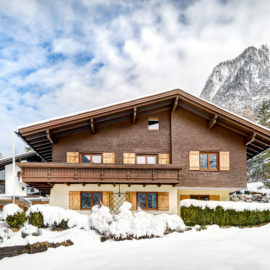 ski in, for up to 4 people; Children and dog? But of course! 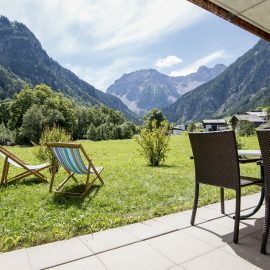 The luxury of this apartment: It is located directly at the confluence of the Alvier and Palüdbach and spoils you with an impressive, completely unobstructed view of the highest Rätikonberge, on meadows and forests. In summer and in winter you have a lot of great nature around you, which you can admire undisturbed from the terrace. 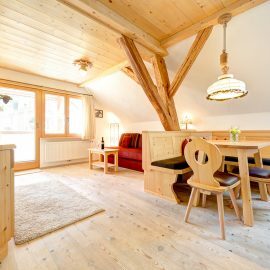 In the high-quality kitchen prepare your favorite dishes to your heart’s content and enjoy them at the large handmade wooden table or you can find here for dinner, chat and play together. Or you can let the roaring fire in the stove on you. On the private playground, your little one will find a slide, a swing, a sandpit and free play areas, maybe also nice playmates from a neighboring apartment. After the adventures of the day, refresh yourself in one of the two bathrooms and dream in the stylish bedrooms with high-quality mattresses under fine duvets in the next enjoyable day. Appartment Füchsle can be combined well with Appartment Murmele. Both are on the ground floor with opposite, entrance doors. You have direct access to the cross-country ski trail. A few minutes to the Palüdbahn with winter and summer operation.